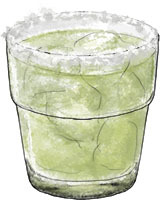 So now, when I think of Margaritas, I mentally add the words “aka Stephanies”. This entry was posted in The Wednesday Tipple and tagged cocktail, ice, lime, margarita, salt, West Side Story. Bookmark the permalink. In Limey-land – is superfine sugar the same as caster or icing sugar? Caster Sugar. Americans call icing Sugar Confectioners Sugar, btw. Hope you have a good time drinking these and getting nicely hammered.